Bus Lanes: Do You Love them or Loathe them? However, when the clarinet teacher returned home yesterday, the situation had escalated out of control. Pauline was shocked to discover her car was gone. Thinking it had been stolen, she rang the police, who told her to contact the Trace Information Service (see box right). Trace told her her car had been impounded - by Ealing Council. She told us: "I gave the very helpful man at Trace the registration number of my car. He went tap tap tap into his computer and told me very kindly that my car had been impounded by Ealing Council."" "I must say that once I had tracked down my car I had to sit down and have a cup of tea. It's quite a shock to find your car has disappeared and I'm not sure that finding out the Council had taken it made me feel a whole lot better." 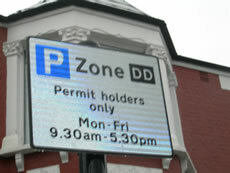 "The thing is, the whole business of installing the new parking zones in South Acton has been a complete muddle. There is a very short stretch of road, numbers 1-21 Avenue Road, which is in two parking zones. I've been given a Zone K permit while most of my neighbours have Zone DD permits. There are DD signs all along this very short stretch of road until Berrymead Gardens when everything becomes Zone K.
"I've had several conversations with people at Ealing Council who tell me I can be in either zone. But I keep telling them I want to be in Zone DD like most of my neighbours. If things like this are going to happen because of the confusion, I think that's unacceptable. Luckily, I wasn't too badly affected by my car being taken, but someone who wasn't feeling well or who had to get somewhere in a hurry could have been seriously inconvenienced. "However, Ealing Council have now brought back my car and I've told them in no uncertain terms that they must send me a Zone DD permit." In fact, Pauline's new Zone DD permit arrived this morning, so she is the proud owner of the DD she has always wanted. Perhaps in due course Ealing Council will decide on a rationalisation of this confused Zone situation.